After twelve hours preparing a multi-course small plates meal for a dozen guests, it was finally time to sit down and taste the fruits of our (and Nat’s staff’s) labors. 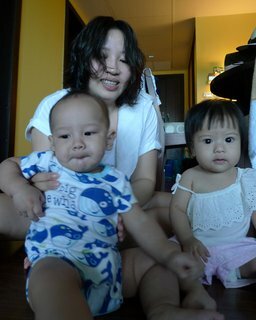 Left – Tawn, Bee, and Cha pose for a picture. 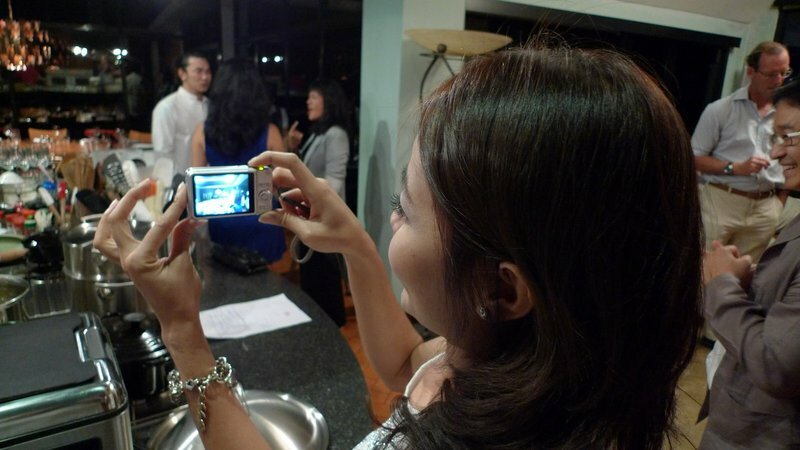 Right – Bee takes a picture of the party. The guests were a combination of my friends, Nat’s friends, and several people we know in common. With a total of thirteen people, there was enough variety of experiences, perspectives, and opinions while having a small enough group to not be overwhelming. I must compliment Nat’s job at arranging the seating as everyone was strategically placed to maximize the interesting conversations. What follows is an overview of the menu that was finally served, as well as commentary on some of the last minute changes that had to happen! 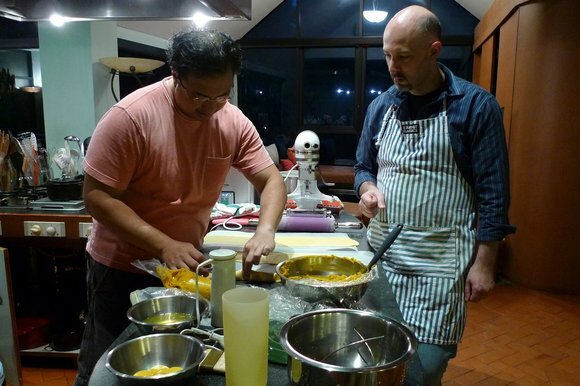 I’ll also critique the dishes, as I think an important part of any culinary undertaking is, in addition to enjoying the food, to learn from the experience. 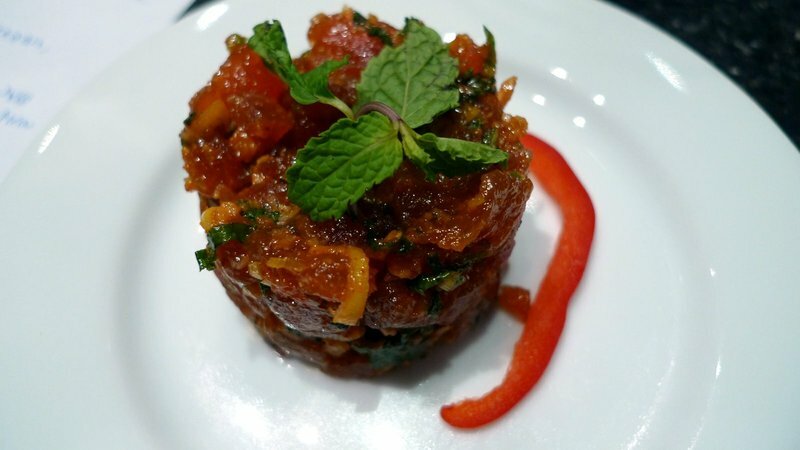 Amuse bouche: Thai-style poke – A mixture of sushi grade yellow fin tuna seasoned with lemongrass, kaffir lime zest, mint leaves, fish sauce, and tamarind paste. While I think this turned out nicely, I have other ideas about how it should be made, based on a dish I had at lunch the next day at a Thai restaurant. You’ll be seeing this “Thai-style poke” concept appearing again in this blog as I refine it. We also managed to veer off the “small plates” course from the very first dish – this serving was about ten bites, when it should have been just two or three. 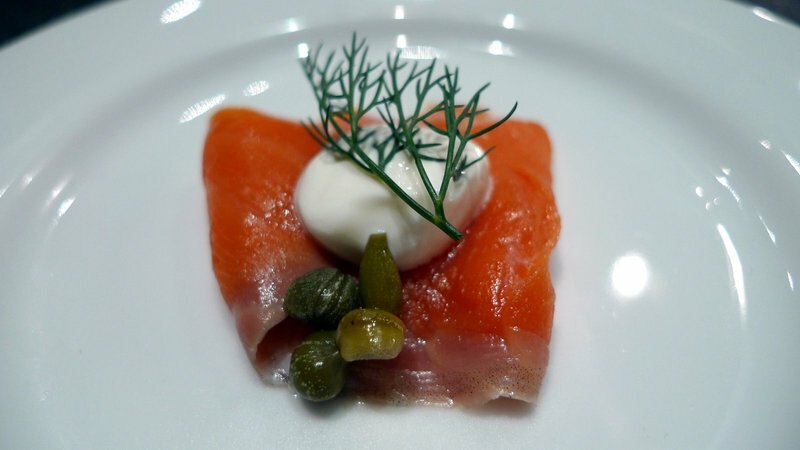 Alternate amuse bouche for one of our guests who does not eat raw meat: a slice of smoked salmon with sour cream, dill, and capers. This was pulled together at the last minute as I didn’t realize we had a guest with dietary restrictions. While not the most original thing to serve, I think it photographed very nicely. Hot Soup: We followed the poke with small glasses of a lemongrass Vichyssoise, a pureed potato and leek soup that had a fragrant lemongrass flavor. This was very nice and was fun to drink. It worked well both in terms of concept and execution. Dinner guests with their hot soup. 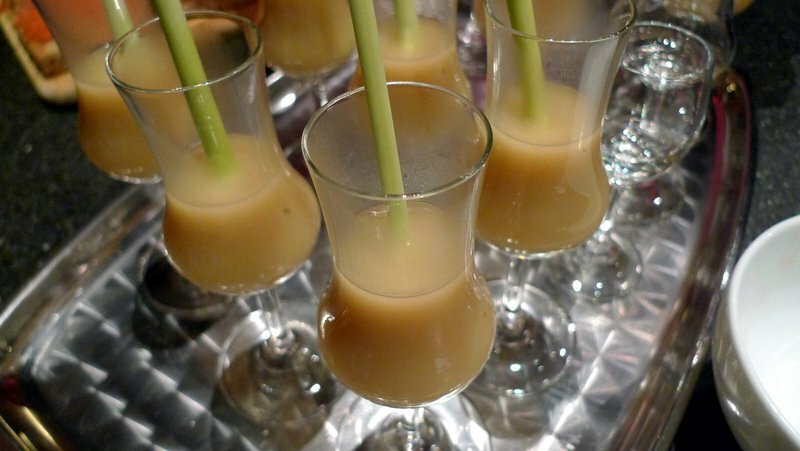 Several people were disappointed that the lemongrass garnish could not be used as a straw! 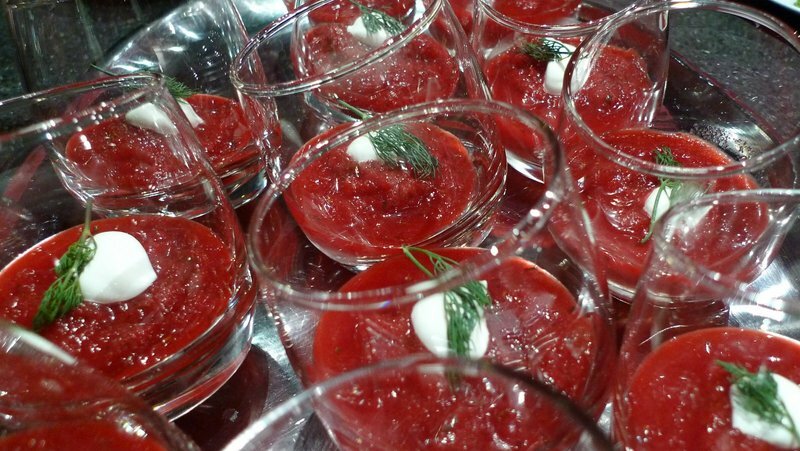 Cold Soup: Tomato and beetroot gazpacho, served icy with a dollop of sour cream and a sprig of dill. In a moment of inspired improvisation (or, at least, what I think was improvisation), Nat explained that the guests were meant to stir this soup to mix in the sour cream, at which point it would have a drinkable consistency. That worked pretty well. The presentation was neat, the flavor was fine but nothing spectacular. I think we should have started with raw beets and gone for something more borscht-like. 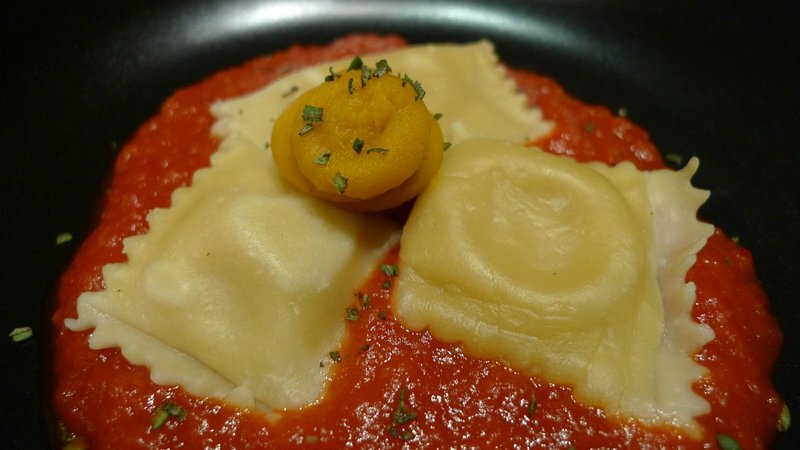 Pasta: Ravioli filled with pumpkin puree served on a bed of roasted red bell pepper sauce. The staff ended up cooking the pasta some thirty minutes before we served the dish and then left it to cool in a strainer, which resulted in a pretty tough exterior. The flavor of the filling, though, was very nice and the contrast with the pepper sauce was fantastic. Next time, I think I need to make a dough that has some color in it, or maybe stipes, just for effect. I’ll be making this at home sometime soon. 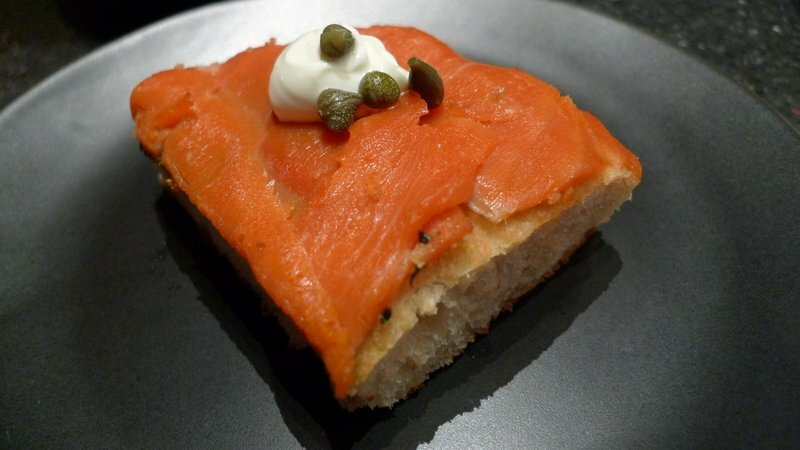 Fish: Smoked salmon served on top of a piece of shiso leaf focaccia, garnished with sour cream and capers. Nat’s focaccia is fantastic and I have to get the recipe. The shiso leaf added an interesting, and unexpected, flavor. I think we could have doubled the number of shiso leaves, though, and cut the serving size in quarters. This is another example of where we lost our focus on the idea of “small plates”. Did I mention, though, that the bread was amazing? Palette Cleanser: To clean the palette after the smoked salmon, Nat served a scoop of a special sorbet. We asked the guests to guess what flavoring was used in addition to the lime juice. 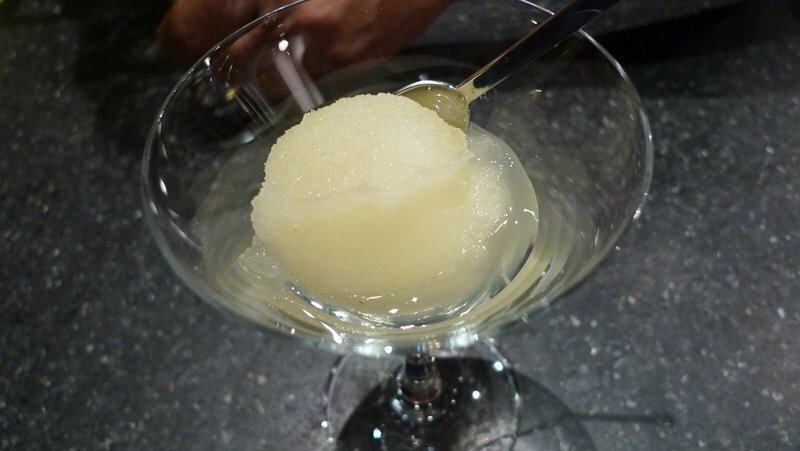 This was actually something he and I had tried first thing after I got there in the morning, settling on lime juice and Frangelico, a hazlenut-based liqueur. The combination was really nice and very surprising. If only I had room in my kitchen for an ice cream maker, the idea of serving a palette cleanser midway through the meal is very sophisticated. 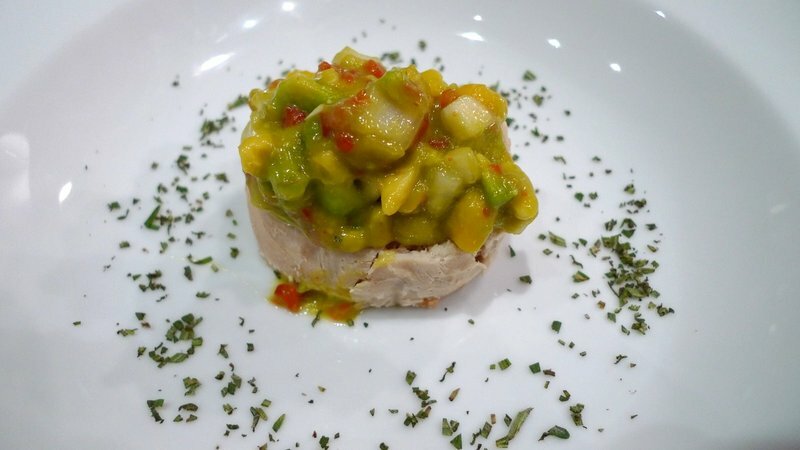 Fowl: The sous-vide chicken breast stuffed with a shrimp and ground pork mixture, served with mango-avocado salsa. This dish underwhelmed me on a couple of levels. The shrimp-pork stuffing tasted very good in the morning – we fried some up just to check the seasonings. But after four hours cooking at a low temperature in the water bath, the flavor was more like pate. The salsa was nice, but mixing it in advance led to the avocado breaking down, causing a creamy consistency. I think it would have been nicer to have a salsa with very distinct ingredients. All in all, this dish probably needs a rework before it is served again. 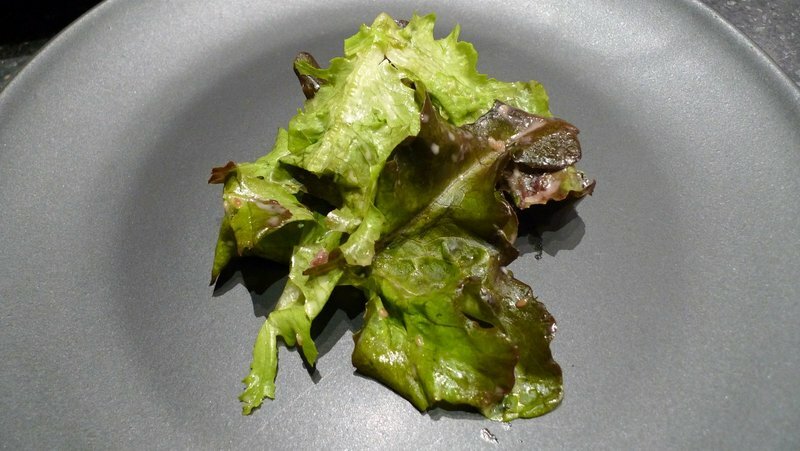 Salad: Simple mixed greens served with a light vinaigrette. Nothing much to be said about this, although it could have used a cherry tomato, Parmessan crisp, or something to cheer up the plate. 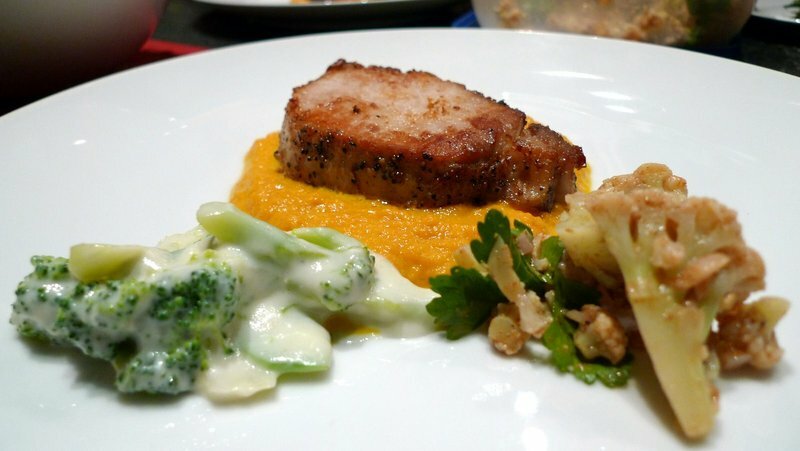 Meat and Veg: Pork loin, cooked sous-vide then pan-fried, served on a carrot puree with curried cauliflower and creamed broccoli. I have to take the blame for this dish that ended up not being more than the sum of its parts. Having not cooked sous-vide before, I underseasoned the pork loin. It was very tender, which was nice, but didn’t have much flavor. Originally, we had discussed slicing the pork then flouring and briefly deep-frying each slice, to give it a nice outer crust. We changed our mind late in the game because trying to deep-fry a dozen pieces of pork (even with a staff to help) seemed like a lot of work. In retrospect, I think that would have been a more successful approach than the pan frying. As for the vegetables, we had a lack of focus and this is one place where some advance planning would have helped. I made the cauliflower in advance, because I like the recipe, but the flavors didn’t have anything to do with the rest of the plate. The creamed broccoli was meant to contrast with the cauliflower while having a similar shape, but it also evoked a bit of an “meh…” response on the taste buds. The carrot puree, which we wanted to leave as a neutral canvas for the pork, could have used something other than salt and pepper to season. A stronger flavor – cumin, maybe? – would have been nice. At this point, we had served too many too-large “small” plates and guests were getting full. It was at that point that we decided to skip the cheese course – sad, because we bought some nice cheeses! – and then the individual cranberry souffles were knocked off the menu because one of the kitchen staff mistook the souffle base for a sauce. While in the kitchen plating another course, I looked at the stove and asked Nat, “Is the cranberry mixture meant to be boiling?” The answer, of course, was no. Scratch the souffles. Dessert: Peppermint ice cream. 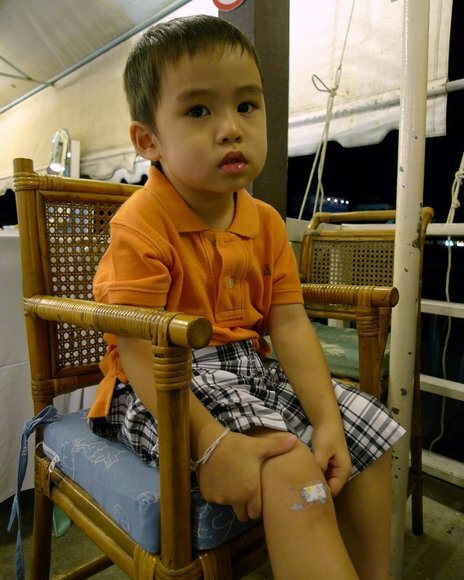 We were left with only the ice cream for dessert. 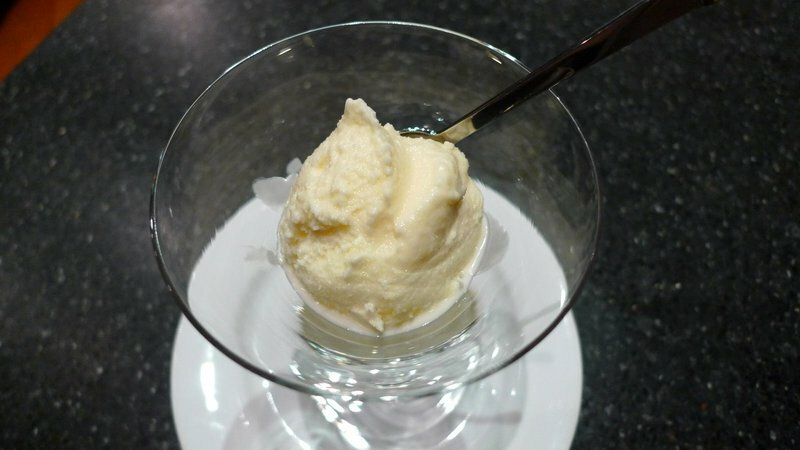 This was meant to be a rosemary ice cream but after an hour of the rosemary steeping in the cream mixture, the flavor was indistinguishable from vanilla. Running out of time, we settled on peppermint, added the extract, and started freezing the ice cream. The flavor was perfectly nice and made a nice conclusion to the evening, though. 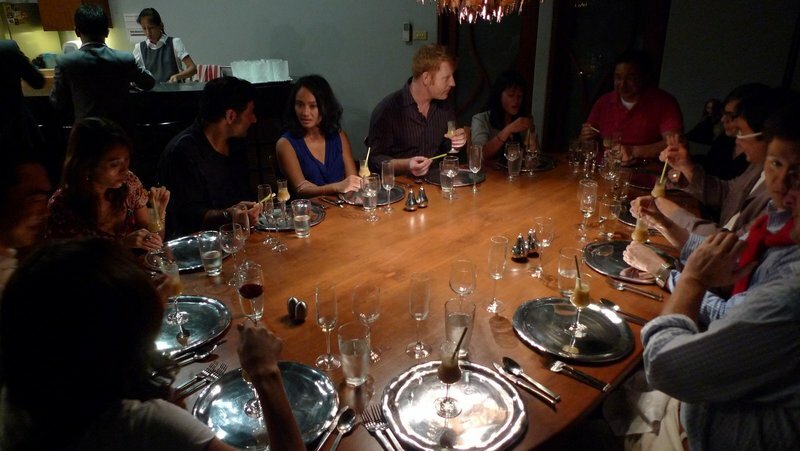 Saturday night, my friend Nat and I hosted a lavish dinner, some ten courses for a dozen or so guests, held at his house. 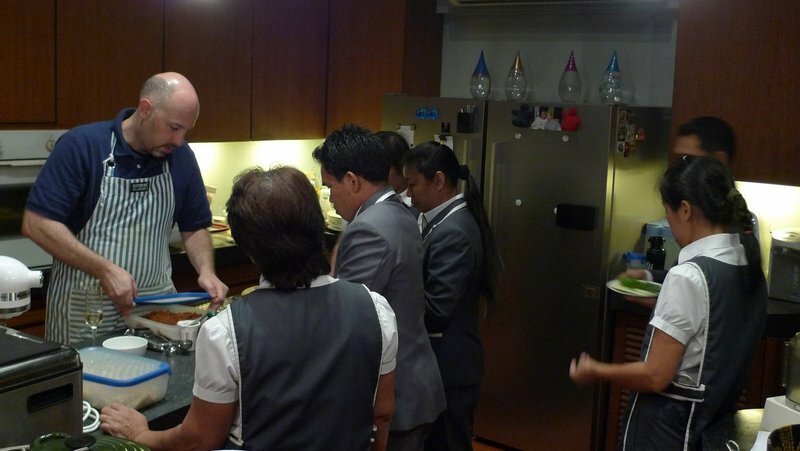 The preparations took twelve hours and we were assisted by six staff members. In the end, despite “small” courses that filled diners so much that we skipped the cheese course, and despite having to scrap the cranberry souffles because a sous chef mistook the base for a sauce and boiled it to death, things turned out nicely and a good time was had by all. On the grand scale of cooking styles, with “tedious planner” at one extreme and “wing-and-a-prayer” at the other, I’m more towards the later than the former. 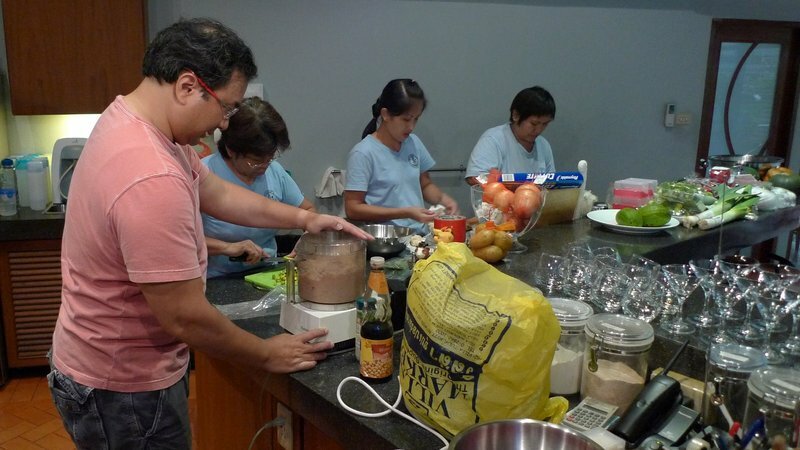 In my kitchen, recipes are suggestions and usually are more of a starting point rather than scriptures to be followed. However, it is safe to say that Nat is even further to the “free-form” end of the scale. Our brief email exchanges in the days leading up to the dinner are the full extent to which we planned in advance. Instead, I showed up at his house at shortly after 8:00 Saturday morning. We discussed a menu and then headed to the market relying on nothing more than our collective minds in lieu of a shopping list. While we were working from a wee bit of a plan, there was a lot of improvisation based on what we saw at the market. “These look good, let’s use them as a sauce!” We returned home and started preparations, talking through the schedule of what should happen over the next several hours before guests arrived. We were working from this rough plan: an amuse bouche (appetizer) of a Thai-style tuna poke; a lemongrass flavored Vichysoisse (potato and leek soup), served hot; a tomato-beet soup, served cold; pumpkin tortelloni served on a roasted red bell pepper sauce; smoked salmon and shiso leaves on focaccia bread; a lime sorbet as a palette cleanser; chicken breast stuffed with pork and shrimp, cooked sous-vide and served with a mango and avocado salsa; a salad of plain greens; a pork loin simply seasoned and cooked sous-vide, served with pureed carrots, curried cauliflower, and creamed broccoli; a selection of four cheeses served with dried fruit; individual cranberry souffles served with rosemary ice cream; and tea/coffee/digestifs served with petit fours. All joking aside, having a competent staff really did make a huge difference. While Nat and I were both hands-on, it was helpful to have people to wash, cut, pound, etc. 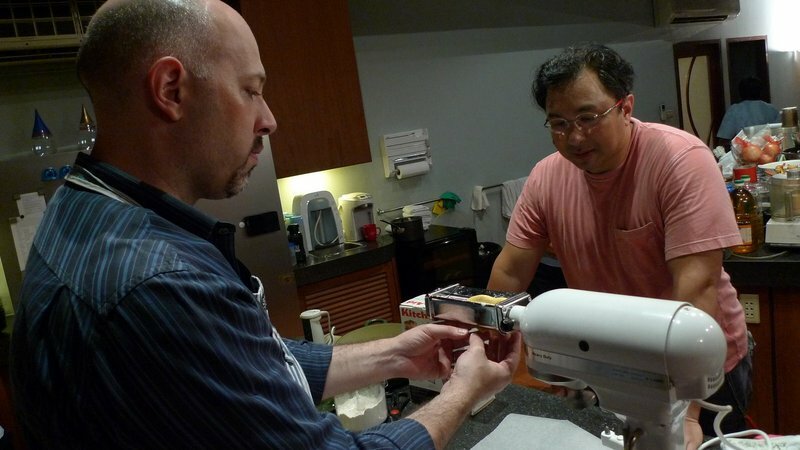 The meat dishes were the first ones we prepared, since they were going to be cooked “sous- vide” or in a vacuum. I’ll explain that in a moment. First step was to pound the chicken breasts and then arrange them so they made a rectangle. The chicken breasts were topped with a blended mixture of pork and shrimp, seasoned with soy sauce. This mixture is very similar to the filling used for wontons. Nat then rolled the whole thing into a log so that, once served, a slice would have a pleasing spiral shape. 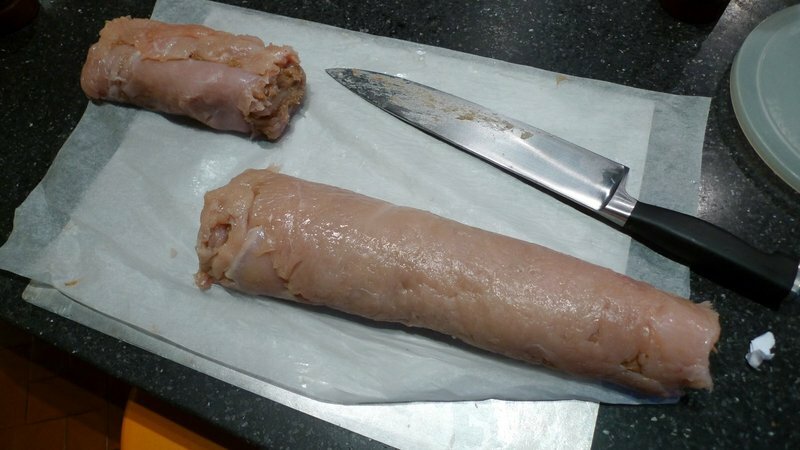 The stuffed chicken breasts were then cut into three sections, each of which was tightly wrapped in plastic wrap and then placed in a vacuum bag and sealed. 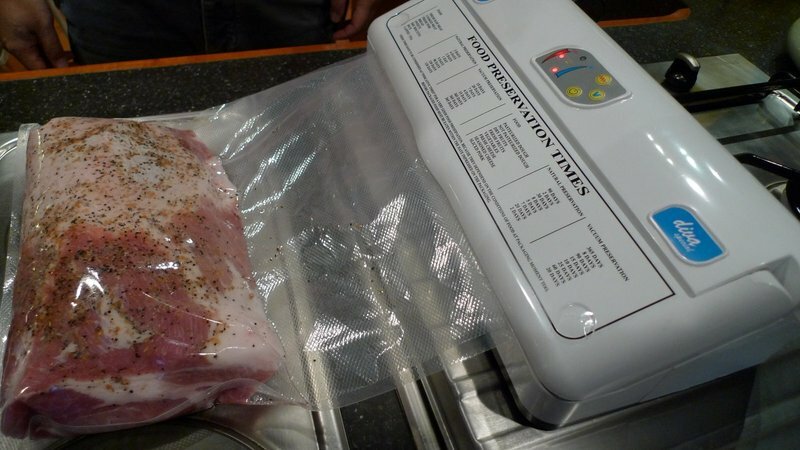 The pork loin, covered with a spice rub, is sealed in a plastic bag by a vacuum sealer. 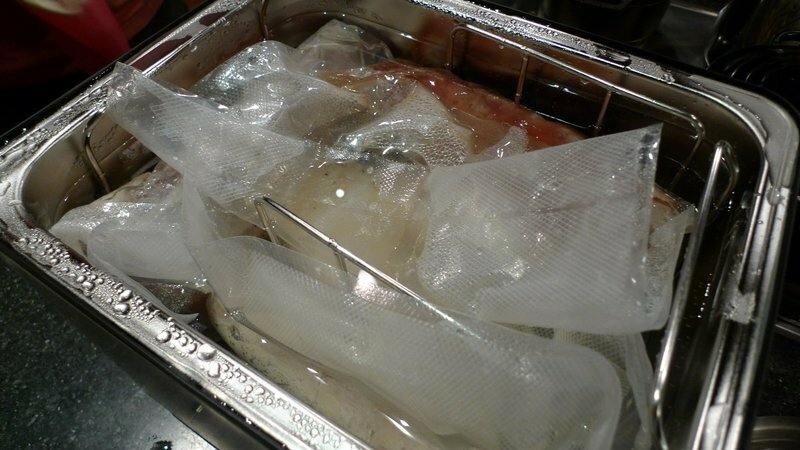 Our cooking method for the chicken and pork was to use “sous-vide” – French for “under vacuum” – a technique in which food is cooked in a sealed bag that has the air removed from it, and then the bag is placed in a water bath and cooked at a low temperature for a very long time. In this case, the pork was cooked for 8 hours in a 147 F water bath. The benefits of this technique include that none of the moisture and flavor are lost in the process, since they remain sealed in the bag. Additionally, the low and slow cooking ensures that the meat is cooked to the desired level of doneness without overcooking. There are some other benefits that occur at a molecular level – cell walls do not burst, connective tissues gelatinize without the proteins tightening, etc. More about that in the Wikipedia article here. This was my first time cooking with this technique and I’d like to try more of it. 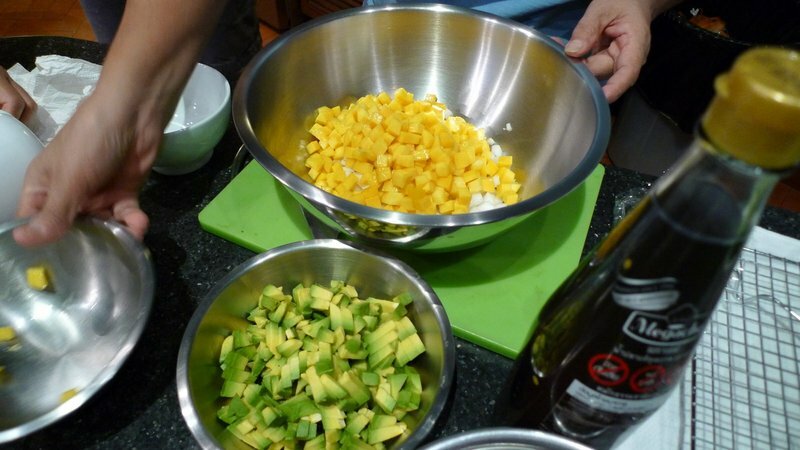 To accompany the chicken, we combined white onion, mango, and avocados to form a salsa that was seasoned with fish sauce. The end result was very tasty, although upon retrospect I wish we had not mixed the avocados in until the last minute as the end result was creamier and less distinct than I had envisioned. The souffle base was made from cranberries, a decision we arrived at based on what berries were in Nat’s freezer. 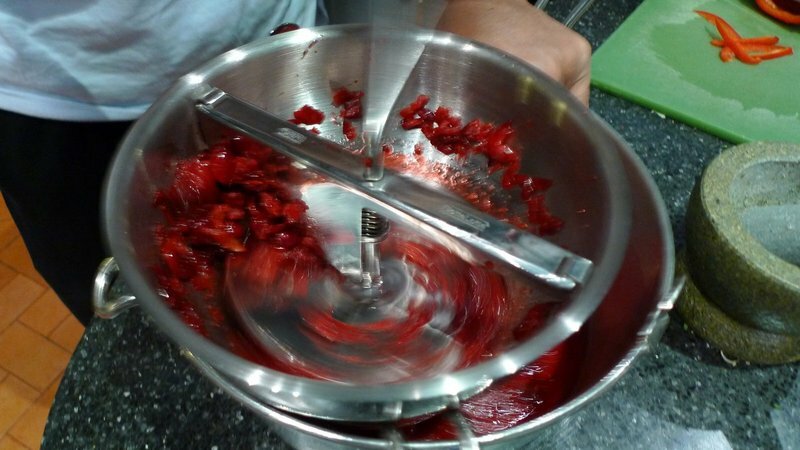 After thawing them, the berries were run through a food mill to extract all the pulp but leave behind the tough skins. The resulting cranberry pulp was then cooked into a souffle base and allowed to cool. Since souffles have to be made just before cooking and serving them, the whipped egg whites would be added during the dinner. Carrots are cooked, to be pureed into the base for the pork loin. Broccoli florets will be steamed and then tossed in a light cream sauce just before serving. 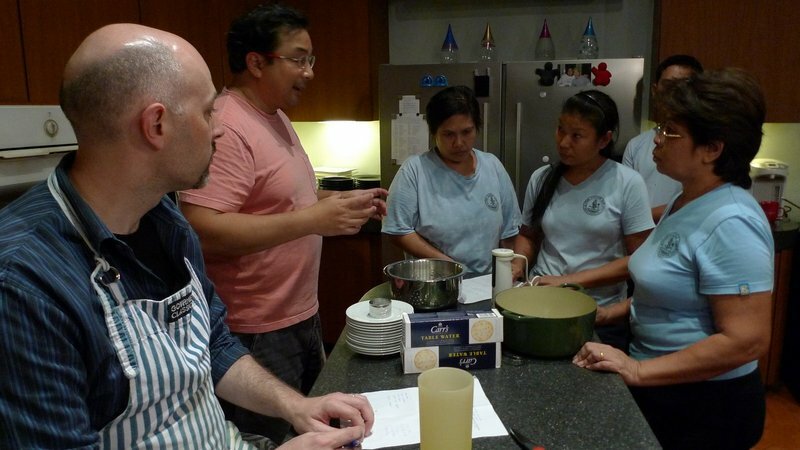 In the late afternoon, after the majority of the team cooking is done, Nat briefs the staff on the order of the meal, how things will be plated and served, etc. The woman with the long hair, who seemed to be the de facto chief of the kitchen staff, took meticulous notes, longer than what Nat and I were working with. 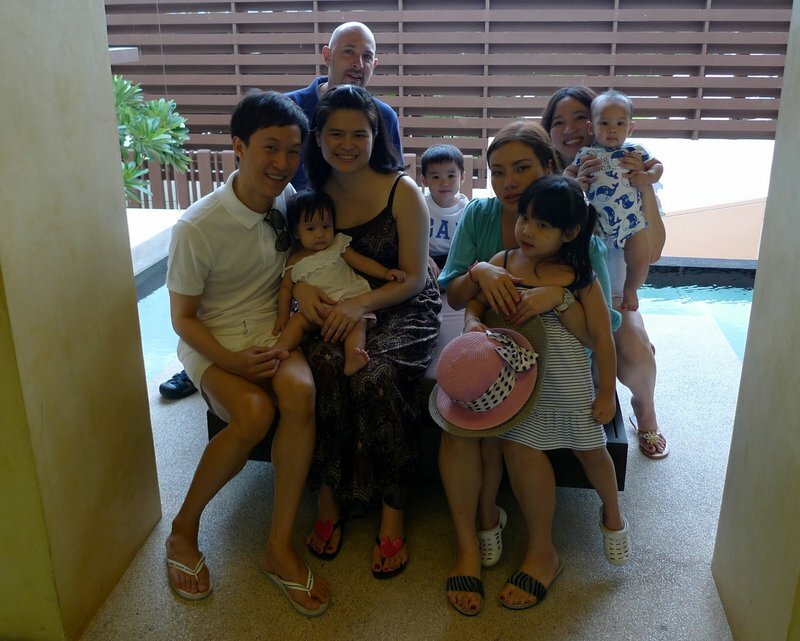 The staff then had a few hours’ break before returning for final preparations. Another dish that I worked on earlier in the day (we’re jumping around, time-wise) was the amuse bouche. When Tawn and I were in Kauai in March, we enjoyed eating poke (pronounced “pok-eh”), a Hawaiian dish made of sushi-grade seafood (usually tuna), mixed with soy sauce, chili, sesame oil, and a variety of other ingredients to make a salad. 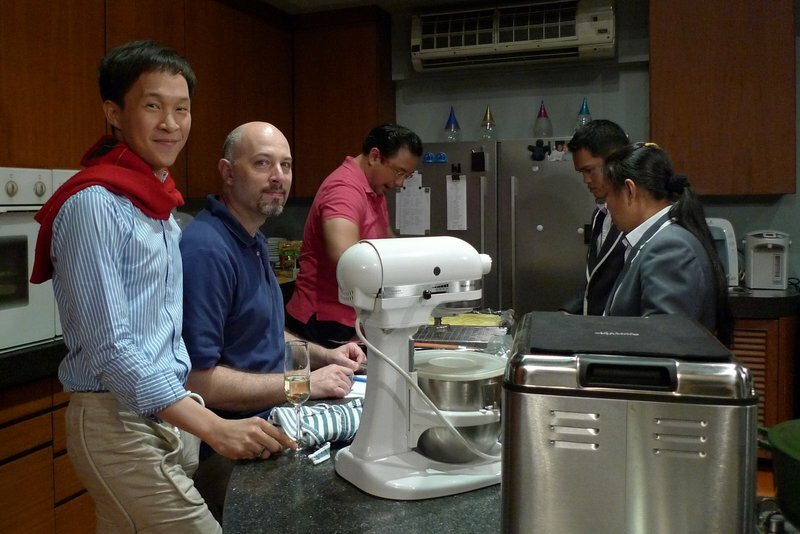 While there, we talked about the idea of making poke with a Thai flavor profile. 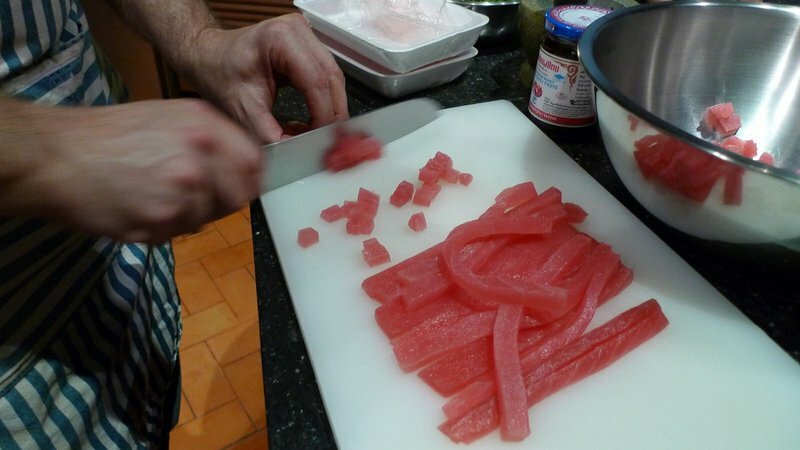 First step was to buy some yellow fin tuna and dice it. 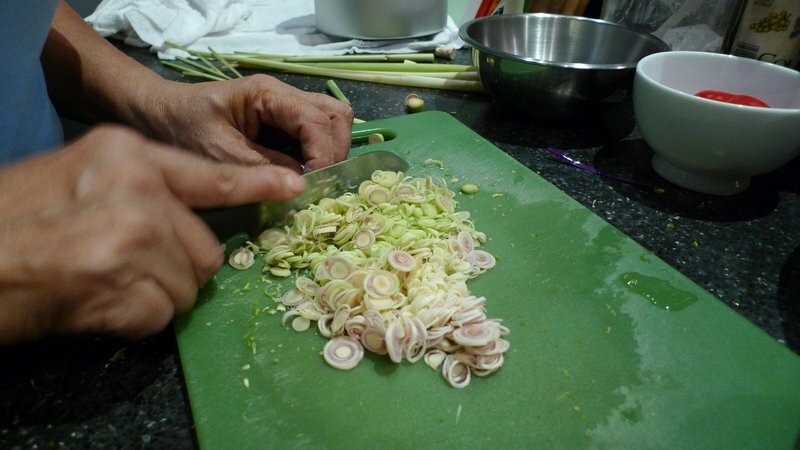 One of the staff, an older lady who was very precise with her knife, chopped lemongrass, mint, and kaffir lime skin. 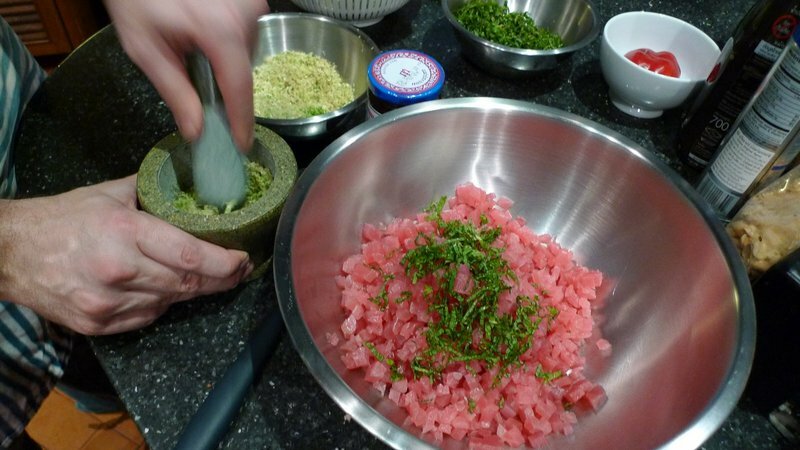 The mixture was pounded with a mortar and pestle to release the oils, then mixed into the tuna. I added prodigious amounts of nam prik pao, a very thick chili paste. The Thai poke after a few hours in the refrigerator. Closer to serving, I doctored it with some lime juice and tamarind paste, which greatly improved the flavor. Nonetheless, I have some thoughts about how this needs to be made differently, based on a dish I had for lunch Sunday afternoon at a Thai restaurant. 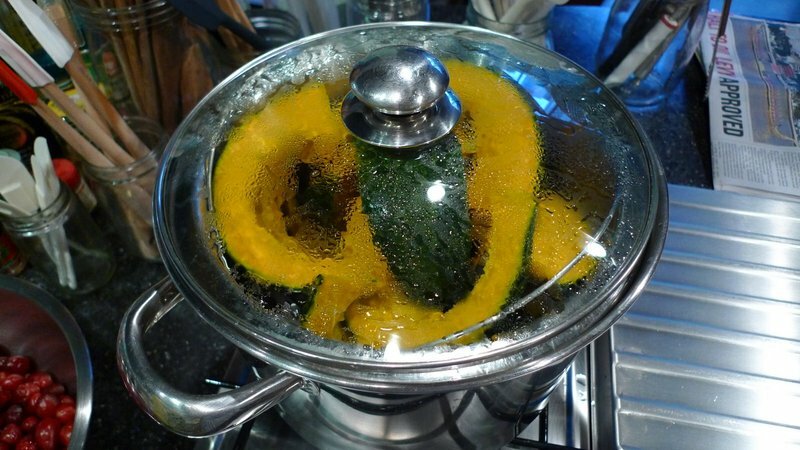 For the pasta, we steamed Japanese pumpkins, scraped out the flesh, then pureed it with a few eggs and seasoned with salt, pepper, and nutmeg. Making the pasta dough became a bit of an adventure because Nat’s pasta rolling attachment, in its debut use, was acting up. One of the rollers kept freezing, which resulted in the dough being stretched and torn, rather than just rolled out. I eventually resorted to the old-fashioned way of doing things: a rolling pin. In this case, a very cool silicone rolling pin to which the dough did not stick, even when I didn’t use flour. 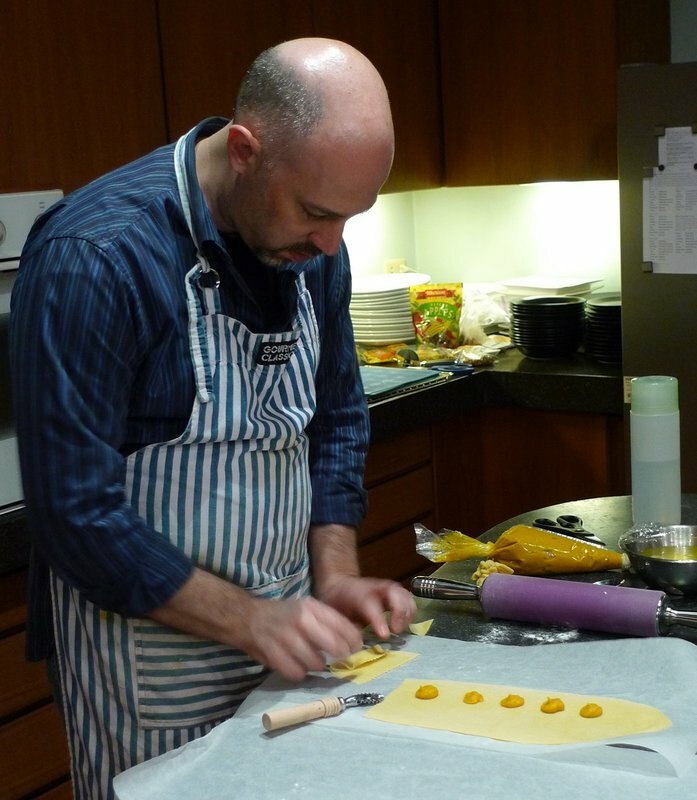 We were originally going to make tortelloni, which are large tortellini, serving a single one per guest. But neither of us were sure how exactly to fold the the pasta. We decided to instead make ravioli, something less complicated, and the results were good. This reminds me that I really should make fresh pasta more often. It is very easy – especially with the Thomas Keller recipe for pasta dough which includes just a little bit of milk – and tastes so much better than dried pasta. 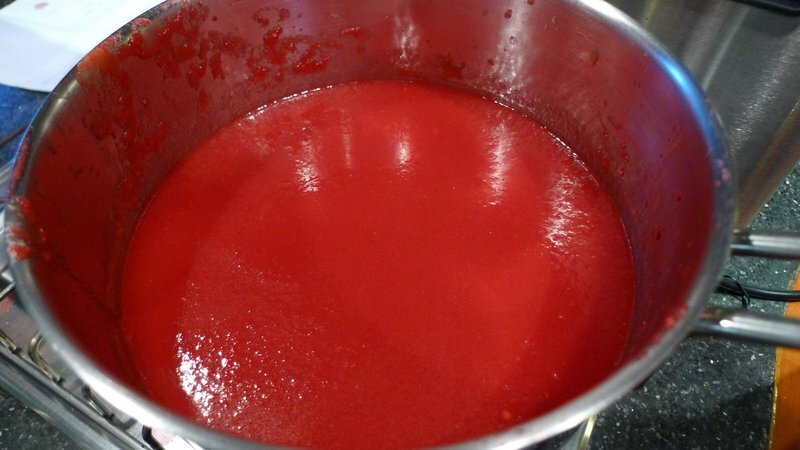 The tomato and beet soup. 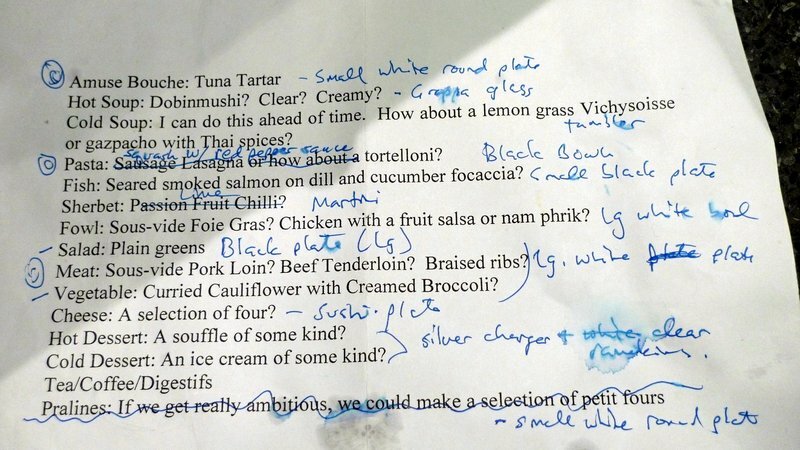 This was a recipe that kept evolving, trying to get the right flavor profile. The big mistake we made was using canned beets, which turned out to be pickled. The soup then had a very vinegary flavor. More tomato puree corrected this and eventually we ended up with something with a nice flavor of herbs de Provence. We wanted to serve a cold soup immediately following the hot one, an opportunity to have contrasting flavors as well as temperatures. To do this, Nat actually placed the tomato-beet soup in the ice cream maker and started freezing it. It was served icy. The other soup, served hot, was a Vichysoisse, a classic potato-leek soup. This was flavored with lemongrass for a few hours, which was then removed before the soup was pureed. Interestingly, the lemongrass gave the soup a light brown color as it steeped. 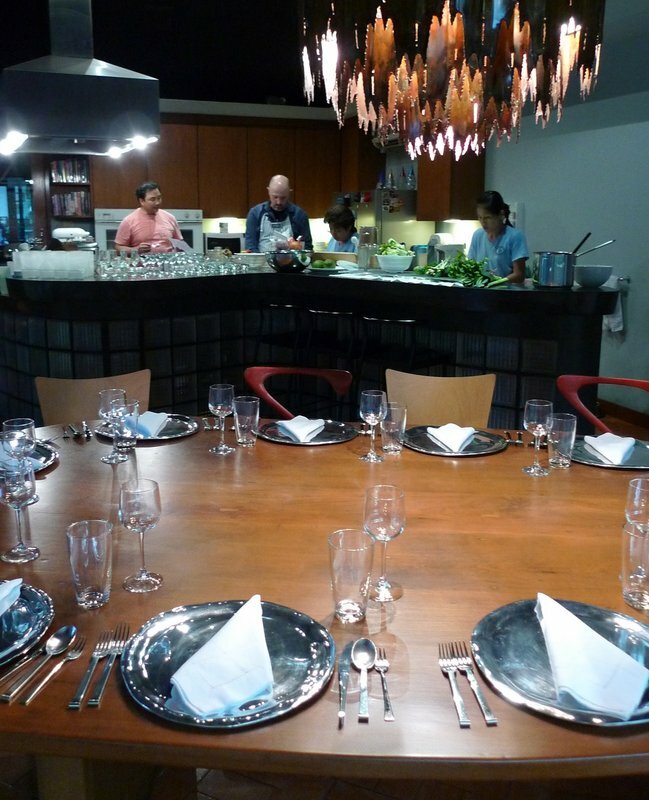 A picture of the dining table with the kitchen in the background. Notice all the glasses on the counter, which were used to serve various courses. 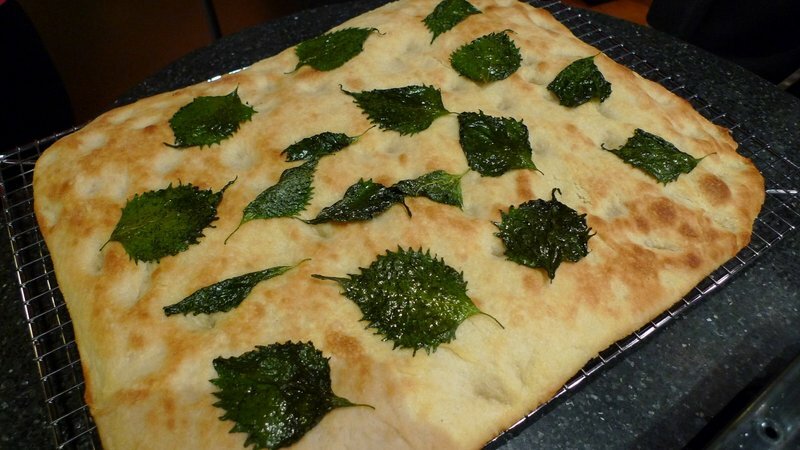 Nat’s focaccia bread, which was divine, topped with shiso leaves. These leaves, also known as perilla, are common in Japanese cooking but I’ve never really been properly introduced to them. When you eat them on their own, they have a pleasant citrusy flavor. I’m going to have to play around with these as an ingredient. The staff helps prepare the salmon on focaccia bread while the mango and avocado salsa comes up to room temperature for serving. The staff, now back from their break and attired in service uniforms, listen as I explain how we are going to plate the poke appetizer. 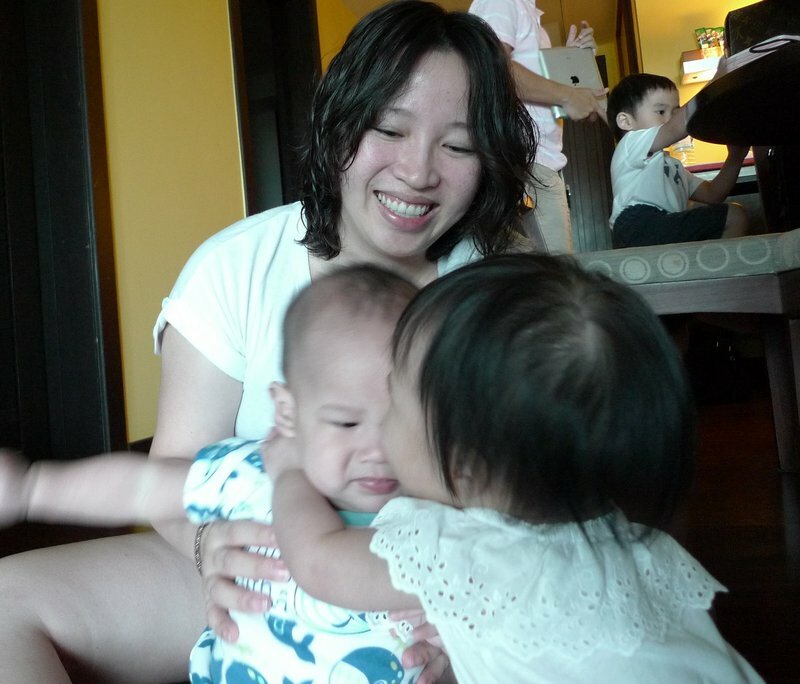 They were enormously patient with my Thai. My instructions must have been clear enough, as they did a good job plating. All I had to do was wipe the plates before they headed out. Tawn and a few guests arrived early, so we opened a few bottles of sparkling wine and visited as Nat, his staff, and I put the final touches on the dinner. 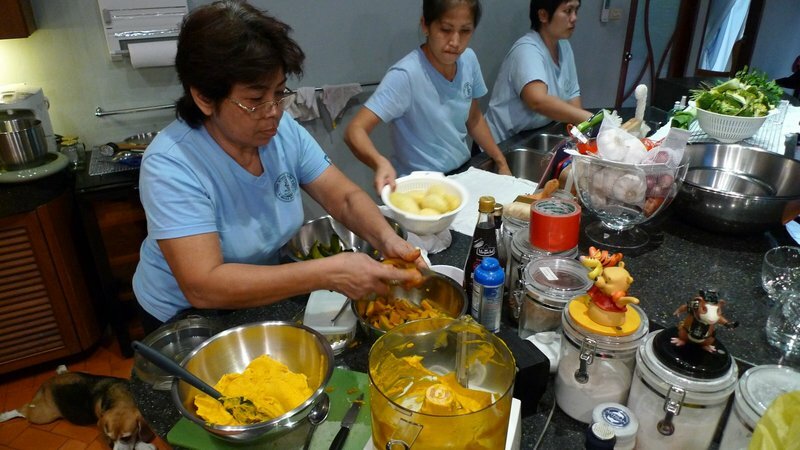 One thing that was nice about having the staff was that we were able to be at the table most of the time and the staff finished plating and bringing things out at the right time. That said, I think we could have modified the menu a bit so that even less time could have been spent in the kitchen during the dinner service. Some twelve hours after the day started, our guests had arrived and we finally sat down for dinner. The finished products will appear in the next entry. Stay tuned! Let’s figure out what is truly possible on Saturday morning. What time would you like to come by? Should we go grocery shopping to see what is available? I whole-heartedly endorse the “teeny tiny courses” concept. 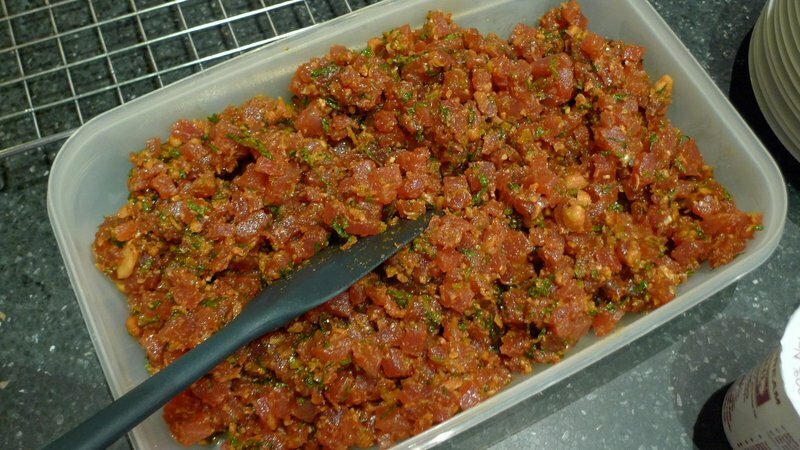 Amuse bouche: something that’s been on my mind since a trip to Kauai in March is the idea of a Hawaiian poke, chopped raw tuna mixed with herbs and seasonings. But I’m thinking, what would happen if it was mixed with more of a Thai flavor, almost like plaa tod sam rot but with sushi grade tuna instead? 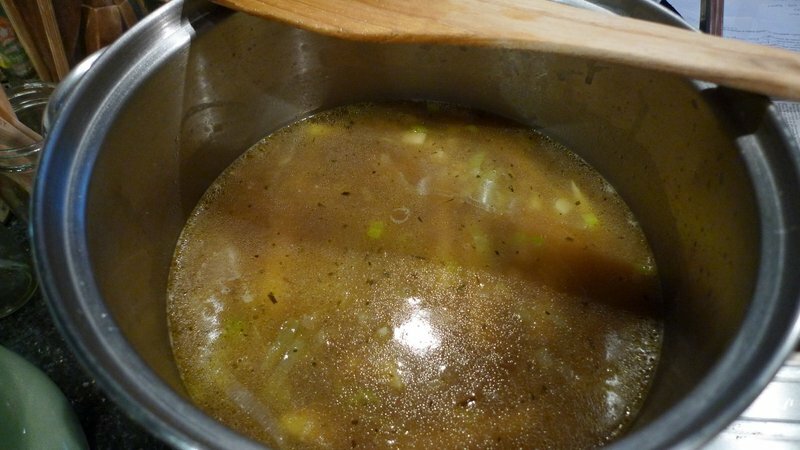 Soups – seems like both a hot and a cold soup may be a bit much, somewhat confusing for the palate. However, I love both your cold soup suggestions. You’re thinking of serving just a small portion, right? Shot glass sized? Larger? Shot sized. I kind of think hot followed by cold or vice versa is a cool way to startle the palate. The first soup sets the tone and the second surprises. I have a blender. Pastas: In my mind I had been thinking small free-form lasagnas, one sheet of noodles folded back and forth with layers of sauce and cheese in-between. Making sausage from scratch might be ambitious, given that it should rest up about 24 hours for the flavors to meld. The thought crossed my mind that a lasagna made of roasted bell peppers might be enjoyable without being overly heavy. Or…. 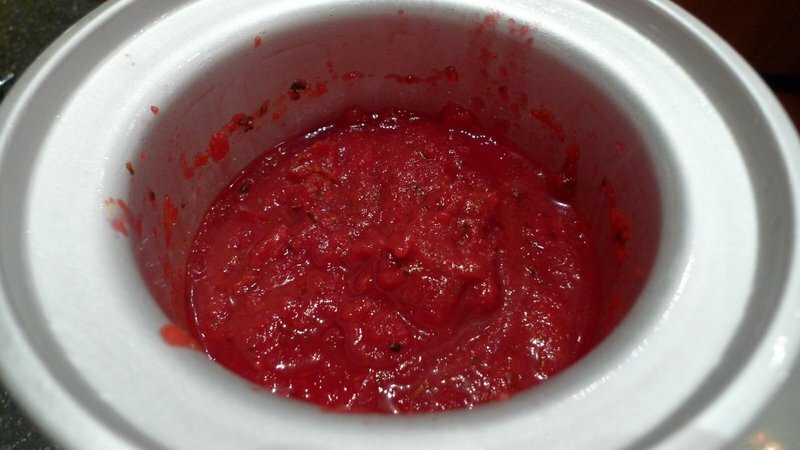 instead of tomato sauce, how aobut a puree of roasted bell peppers and some roasted squash as a filling? Colors could be amazing. Yes. Maybe sausage is a bit ambitious. 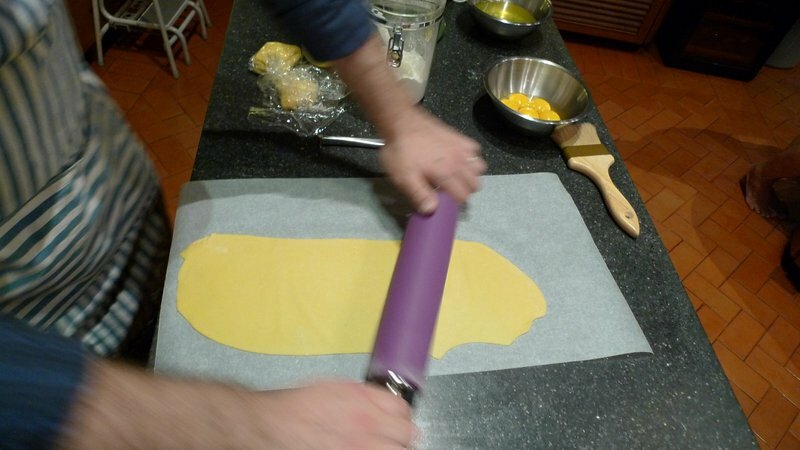 Tortelloni is easy. I’ve done it lots. We do the filling ahead of time and get the staff to help stuff and fold. It cooks in minutes. Fish: Seared smoked salmon on focaccia – so you’re thinking little sandwiches? Open faced? That would be fun. 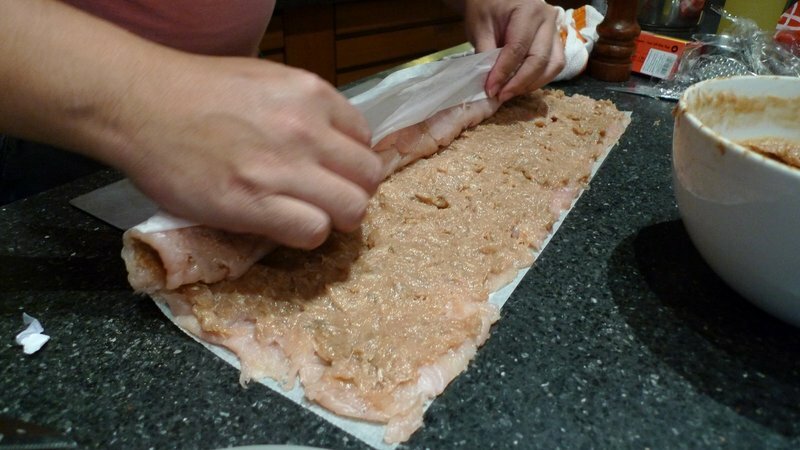 Another idea is if we want to cook small portions of fish rapped in parchment. People enjoy receiving little gifts. In my mind I’m thinking of a firm white fish but with some Moroccan spices and preserved lemon, baked en papillote. I’m thinking open faced. I have parchment too so we can do either. Sherbet – Love passion fruit. 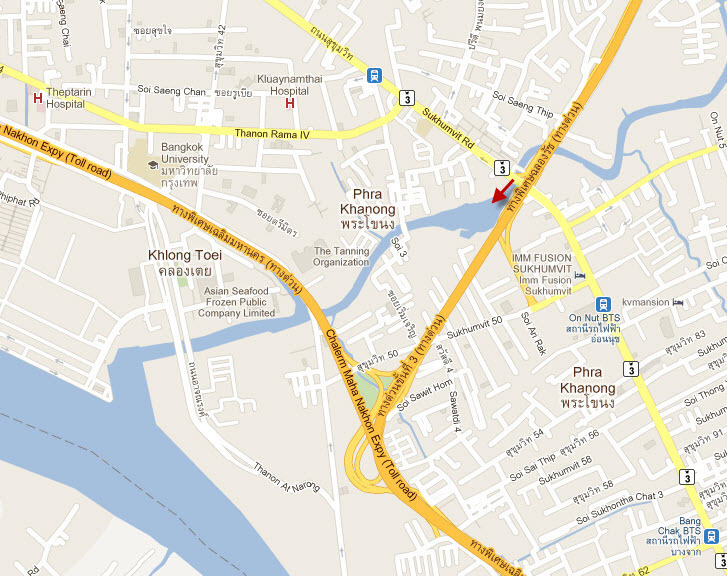 Fowl – Am leaning avay from frois gras but toward the chicken. 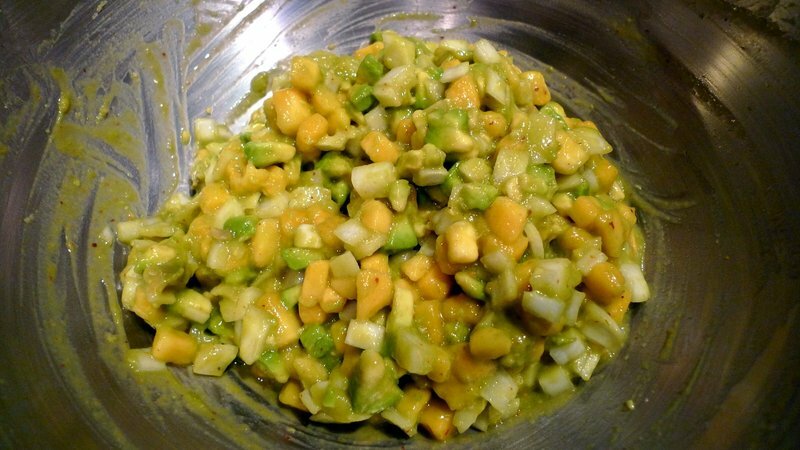 I love the idea of a fruit salsa and am wondering what about something that combines both ripe and unripe mango? I already have some sous-vide chicken in the freezer. Taste it and tell me what you think. Meat – At one level I’m wondering if we need Fish + Fowl + Meat. Seems like a lot, even in small servings. My inclination is towards pork as I know some folks are not beef eaters. Any particular sous vide recipes you like for pork? Pork medallions are great sous-vide but we need to give them six to eight hours. 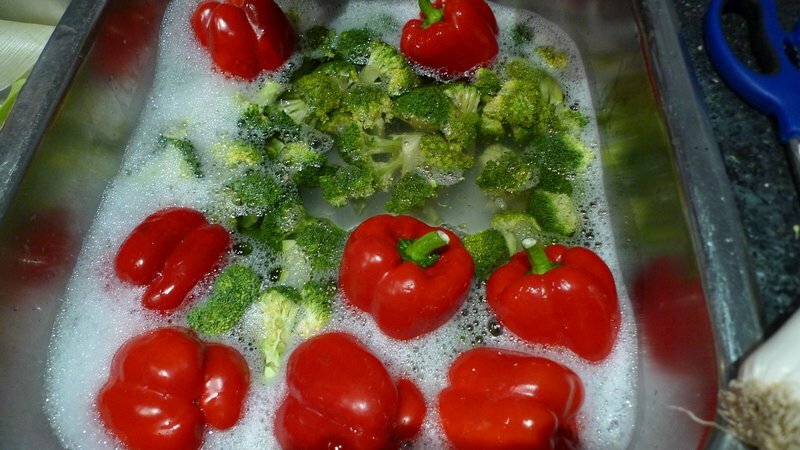 Veggies – I’ll make the curried cauliflower Friday as it needs a day to rest. Flavors are very nice. The idea of pairing it with a creamed broccoli is very innovative. Another idea is to do shelled edamame and cherry tomatoes with mint. Let’s do the creamed brocolli. 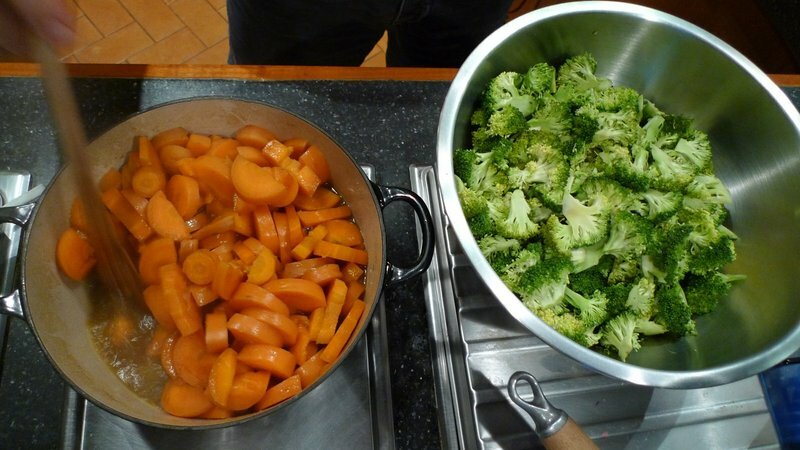 We can prepare the sauce ahead of time and get the staff to steam the brocolli at the last minute. Cheeses – Can do, served with some dried papaya, apricots, and nuts. That’s exactly what I had in mind. Souffle – Chocolate! Do you have enough small souffle dishes for individual or do you want to serve a large one? I have small ramekins so it will take about ten minutes in the oven. I’m afraid I’m allergic to chocolate. How about a berry souffle? Petit Fours!? You’re quite ambitious. This is an area in which I have no experience but am willing to follow your lead. That may be being ambitious. Let’s see. Okay, with all that said, what do you need me to do to help? Shall we take turns being chef? One dish you, one dish me, back and forth? Should be quite an event – stay tuned! 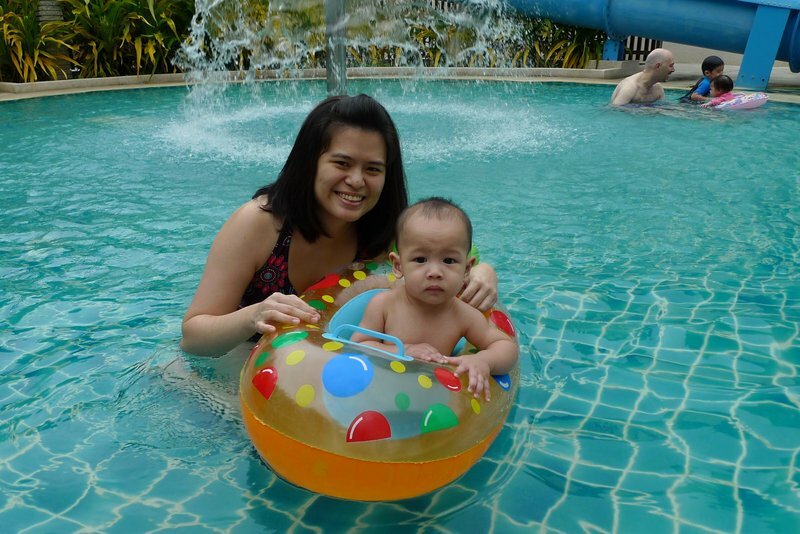 This is the final entry on our trip to Chiang Mai. Since I entered a cropped version of one of these pictures to a contest at the MyWinningPhoto site (I came in second, thank you for your votes), I had to hold off on posting this entry until after voting ended. We arrived just as an afternoon thunderstorm was dissipating. Our initial objective was to have tea but we discovered that the Oriental Tea Shoppe is located in a complex next to the public parking lot on the outer edge of the resort, which effectively insulates the guests within from the bus loads of tourists who visit. 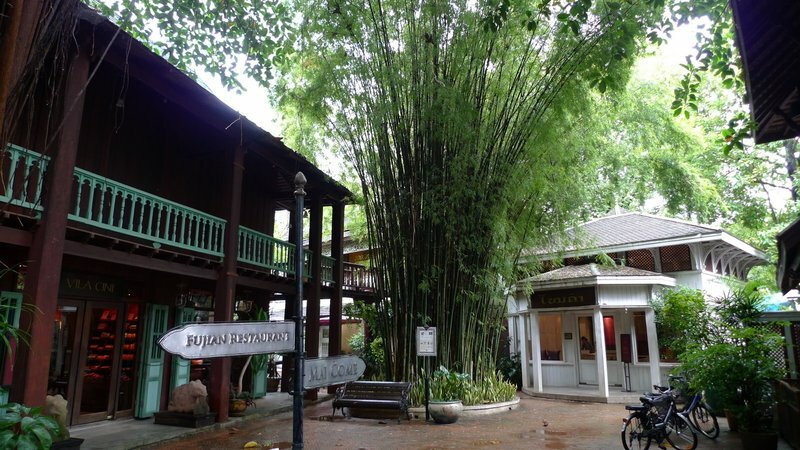 The shopping area looks like some sort of movie set from a Chinese western, but with plenty of bamboo. 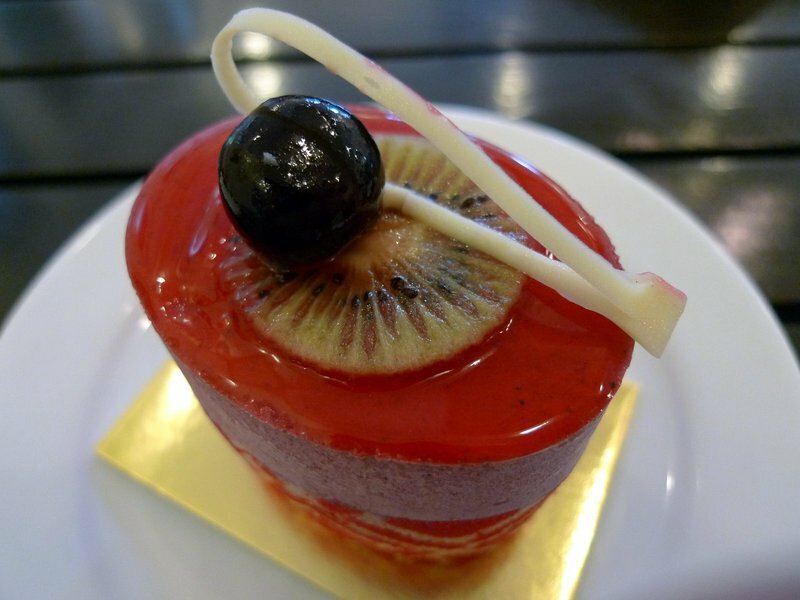 Props to the Oriental Tea Shoppe which, just like its branches in Bangkok, serves beautiful cakes and other pastries to go with their Mariage Freres teas and coffees. 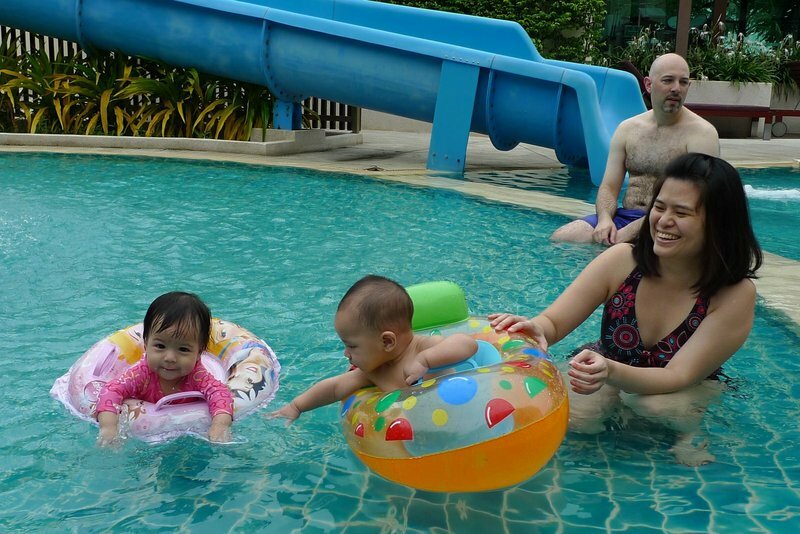 Afterwards, we decided to enter the resort. This is the imposing gate the separates the flagstone-paved public parking lot with the rest of the resort. Follow the Mercedes limousine! 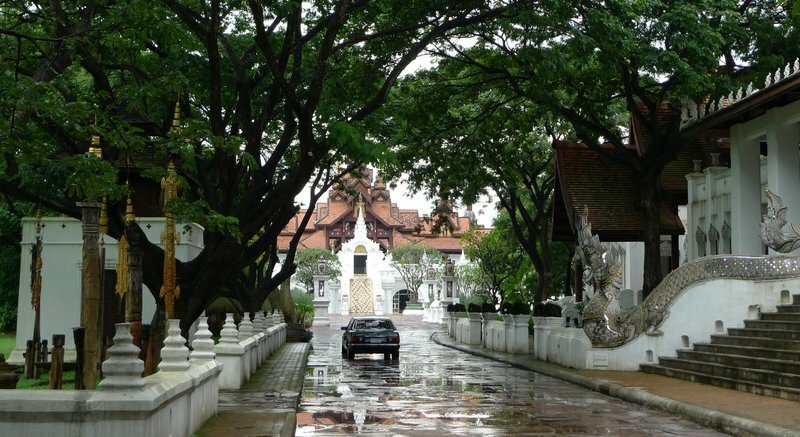 From there, a long tree-shaded driveway leads to the main lobby. 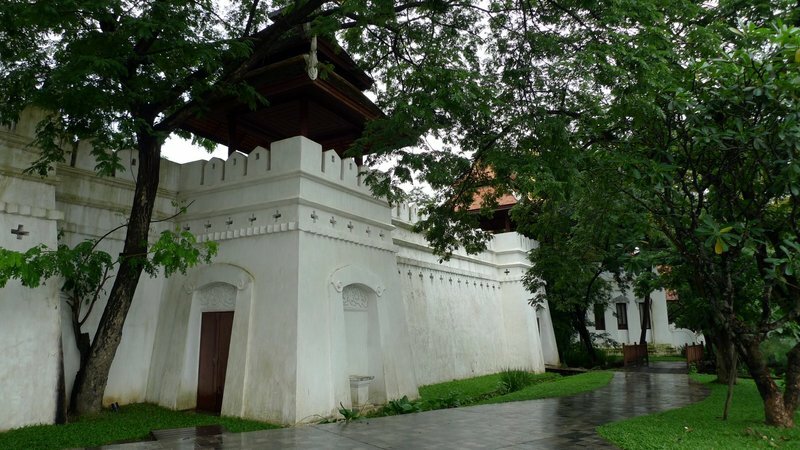 The name “Dhara Dhevi” is a poor anglicization of the name of Queen Chama Thevi (alternately, Jamadevi), founder around 750 CE of the Hariphunchai kingdom, the capital of which was in nearby Lamphun. Looking back towards the entrance gate, these buildings on the left contain function rooms for events, conferences, meetings, etc. 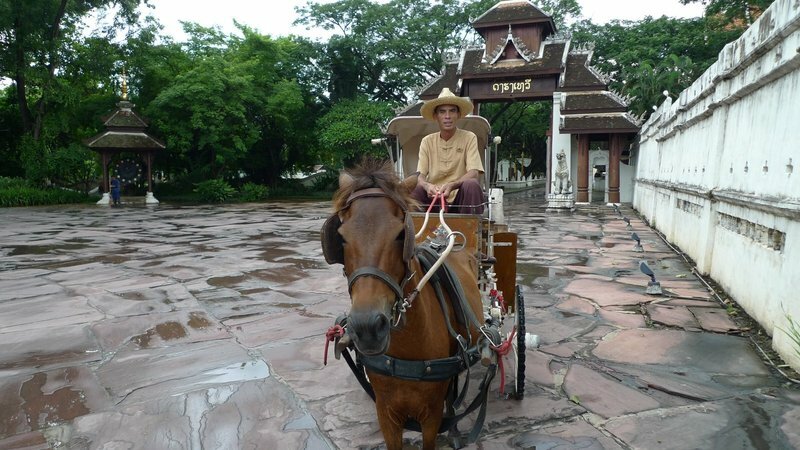 Way down near the gate is a horse-drawn carriage that ferries guests. Bored, the driver offered to give Tawn a lift into the resort and subsequently gave us a 20-minute tour of the grounds. 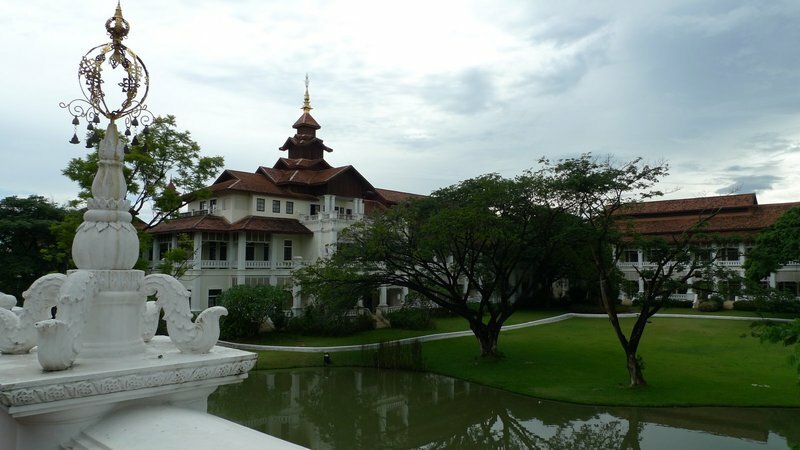 Near the main lobby, walls obscure shops and parts of the grounds, looking more like a Mon fortress than a resort. The sweeping main lobby building. Driveways just to out of the frame of the picture lead to the reception area. 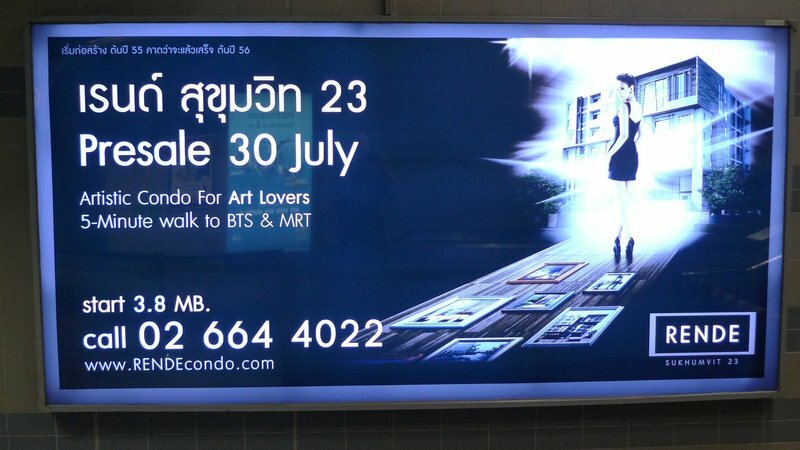 The lower floor is a shopping arcade. 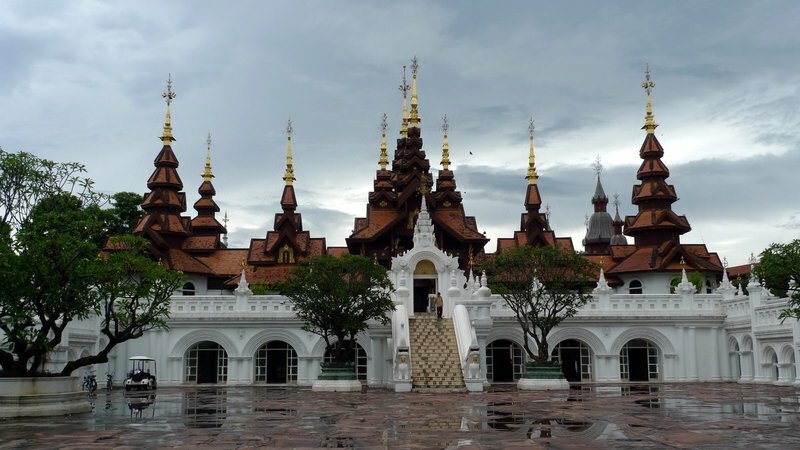 The overall design of the complex is a mish-mash of Lao, Burmese, Lanna, Mon, and Thai architecture, with some Thais criticizing the resort as looking too much like a temple. From the back side of the reception area, you can see two of the larger buildings that contain guest units. 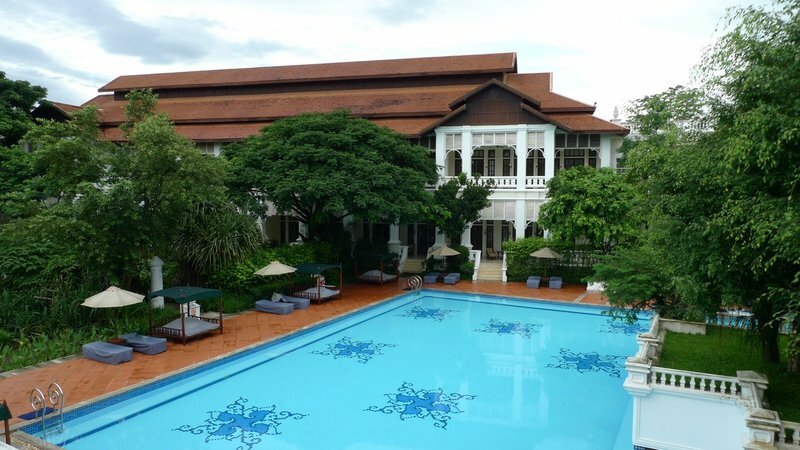 Many of the units, though, are stand-alone villas that are spread throughout the grounds. The swimming pool has some gorgeous tile work. Another two buildings with guest rooms. Granted, this was about twenty minutes after a heavy storm had passed, but the place looked deserted. 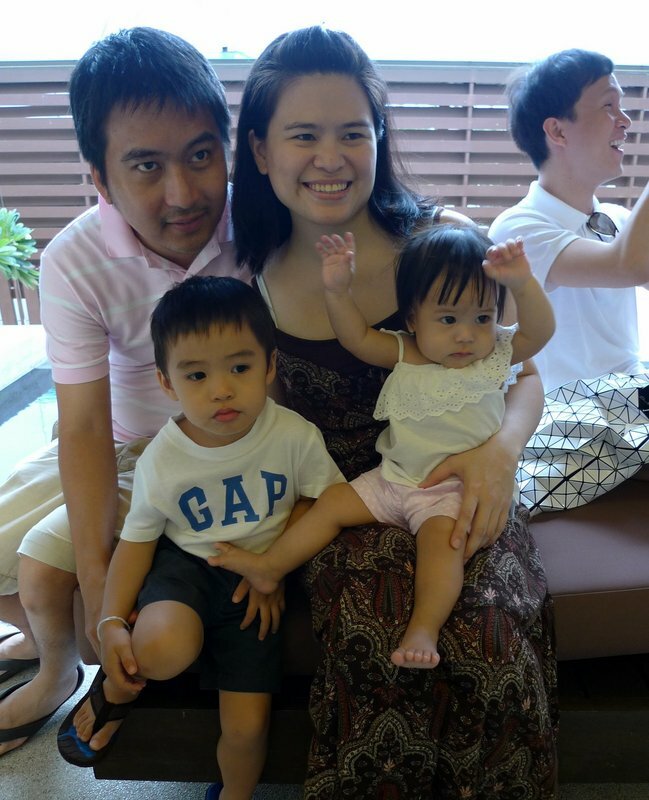 We saw two couples (presumably guests) in the lobby area and passed one family of four while touring the grounds. Other than that, the place was empty. The impression I got from talking with employees was that occupancy was in the low twenty percent range. Rates, though, were still about $400 a night. Looking down the steps from the entrance to the spa, which was also deserted – no guests but no employees, either. 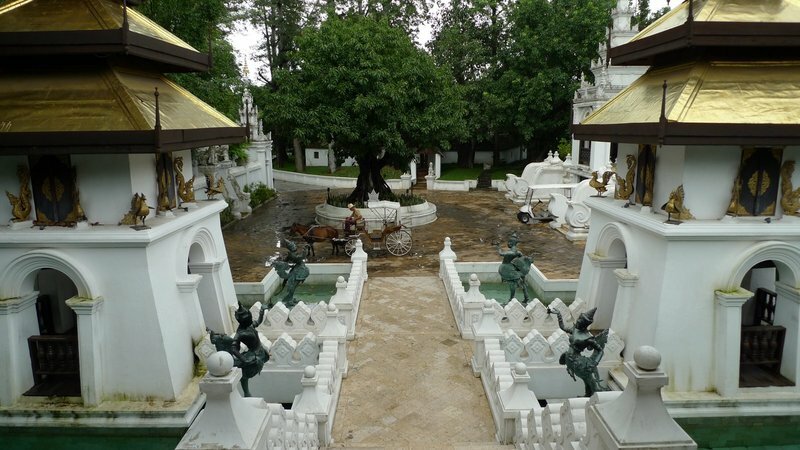 The statues on either side of the walkway are supposed to shoot arcs of water over the path, landing on the other side. 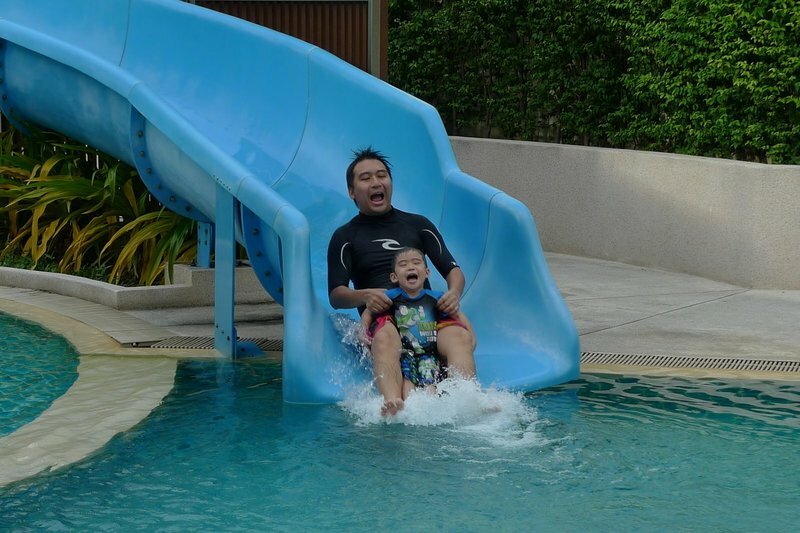 The resort has been open a bit more than five years and there were many areas where significant maintenance was being performed. Unfortunately, the video that I shot while on our horse-drawn tour is on the Mac, which is in for repairs at the authorized Apple retailer. 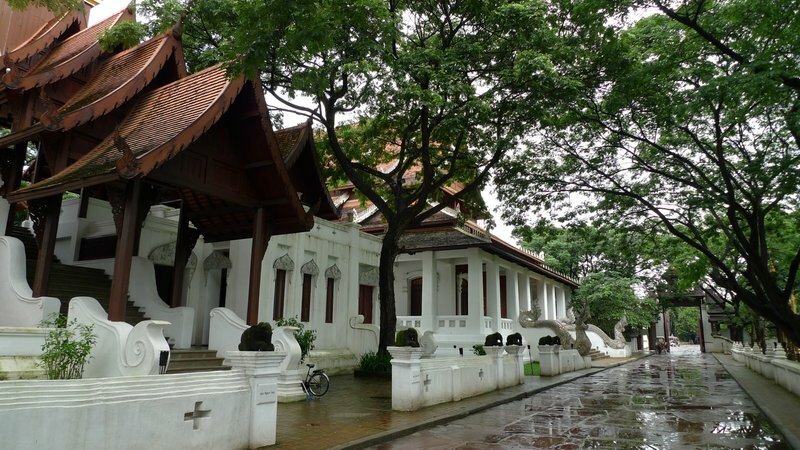 If I get a chance I will post it later as it shows the exteriors of some of the villas, which look like village houses in the midst of rice paddies. Our horse and buggy driver at the end of the tour. 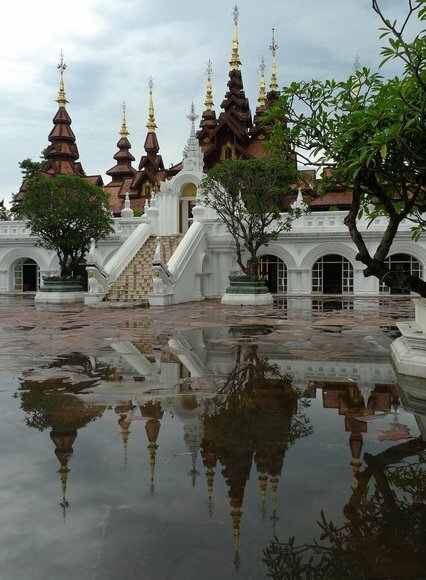 My overall impression of the resort was that somewhere along the way it had crossed the line from “elegant” to “ostentatious,” reminding me more of a pan-Southeast Asian amusement park than anything else. 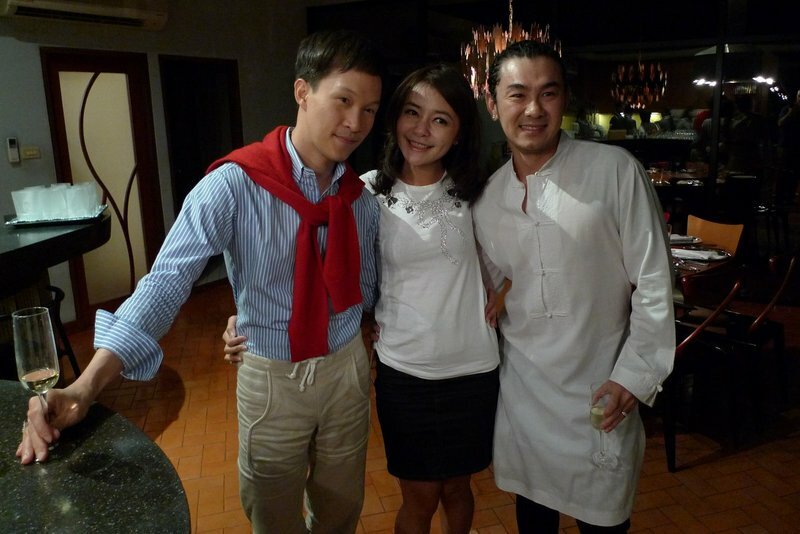 But maybe this is the type of fantasy in which wealthy tourists, Asian and non-Asian alike, wish to indulge in.